Our feet play an important role in getting us around. When we walk or stand, our feet carry the burden of our body weight, as well as the various pressures from movements and the constraints of footwear. Sometimes, pressure placed on the foot becomes out of balance or extra friction falls on particular areas of the foot. When this happens, the body may respond to the pressure by producing thickenings in the surface layer of the skin. These hard patches of skin are called calluses and are part of the body’s defence system to protect the underlying tissue. If the cause of pressure is not relieved, calluses become painful. If pressure becomes concentrated in a small area, a ‘hard’ corn may develop. Sometimes the pressure of the corn or callus may produce underlying inflammation, which can result in acute pain, swelling and redness. Sometimes ‘soft’ corns may form between the toes where the skin is moist from sweat or inadequate drying. These appear white and rubbery and are also caused by excessive friction or pressure. 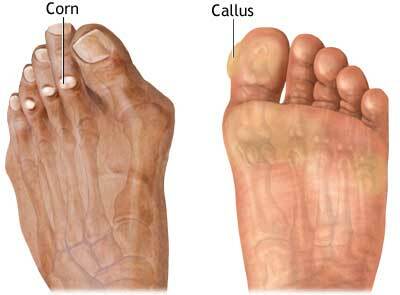 Corns and calluses are most often found on the balls of the feet or the tops of the toes. They can also be found on heels and even along the sides of toenails. Calluses and corns are generally signs of underlying problems and, in some cases, early warning signals of more complex foot disorders. Because they are caused by continuous pressure in one particular area, they may indicate abnormalities or deformity in bone structure or in the way a person walks. Some people have a natural tendency to develop calluses because of their skin type. For instance, elderly people have less fatty tissue and flexibility in their feet and, because of a lack of padding, calluses may form on the bottom of the foot. Also, people who work in occupations that require them to spend a lot of time on their feet are prone to developing calluses. It is important that you never cut corns or calluses yourself. In the warm, moist confines of enclosed shoes infections can easily develop and small cuts can quickly become serious wounds. The best way to prevent the development of calluses and corns is to pay attention to your feet when you feel there is extra pressure on specific areas. Properly fitting shoes are essential, especially if you spend long periods of time on your feet, and it is important that you never wear others people’s shoes. A moisturiser used daily will help to keep your skin supple. But don’t forget that these problems are caused by pressure! If you feel you may be developing a callus or corn, or you already have one, the best thing to do is seek professional advice and treatment from your local podiatrist.